The alignment of wheat and barley through this hop-infused brew embodies the solar system itself… This may be a difficult task, but one our brewers revel in! They brew a galaxy of taste into every batch. ÜberSun is the ultimate experience that will challenge you with each sip. ÜberSun pours a fizzy golden yellow with a steady stream of bubbles drifting through the glass. An inch of banana cream foam sits atop the beer, leaving lacing hanging like dried soap on a shower wall. When I took my first whiff of this beer I imagined buttermilk biscuits slathered with butter and honey. This was just what I was hoping for while standing outside on that warm August day. On my next few sniffs I picked up hints of wheat and toffee, just to remind me what kind of beer this was. As the beer warms the dry grass-like scent of the Centennial hops become apparent. The taste is a blend of warm biscuits with honey and a faint grass/grain like dryness. Banana is present in the backend, but doesn’t intrude or over power. The flavors blend together as the beer nears room temperature, creating a creamy, smooth, easy-drinking concoction. Mouthfeel is light and slightly creamy, with a fizziness that is noticeable in each sip. There is a pilsner-like dryness that is uncommon for the style and creates an unpleasant flavor as you finish each sip. That is unfortunate. 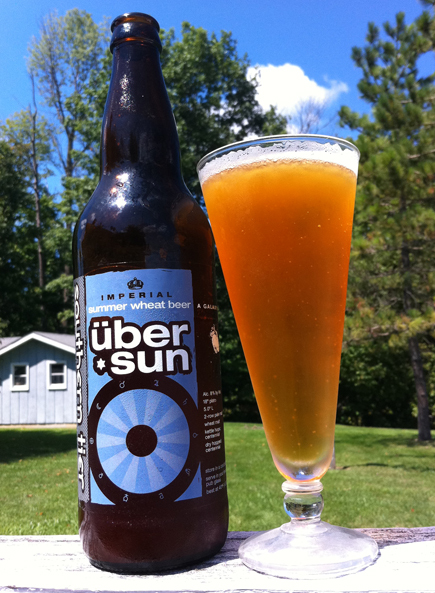 ÜberSun is a fairly big beer, especially for a summer wheat beer. I could see sharing this with friends over burgers and grilled sweet corn. However, I would suggest drinking it cold(ish), because that dryness in the mouthfeel can be a bit distracting.